Two years ago, a 16-year old diver named Alex Weber was swimming off Pebble Beach along the Pacific near Carmel, Calif.
"My dad raised me underwater," says Weber, and she means it. She's a free diver: no scuba tanks; she just holds her breath. She was diving in a small cove and looked down and saw something weird. "You couldn't see the sand," she recalls, still sounding incredulous. "It was completely white." There are sharks in the water there, but Savoca says that wasn't the real threat. "When we were out there," he says, "We'd hear, 'plink, plink,' and we'd look up on the hill and there'd be golf balls flying in off the course right into the ocean where we were doing collections." Despite the aerial barrage, they kept at it, says Weber. "Whenever we had good conditions, we were able to pull out between, like, 500 to 5,000 golf balls," she says. In the journal Marine Pollution Bulletin, the team notes that golf balls are coated with a thin polyurethane shell that degrades over time. They also contain zinc compounds that are toxic. Savoca points out that the surf and currents act like a rock grinder and break down the golf balls. 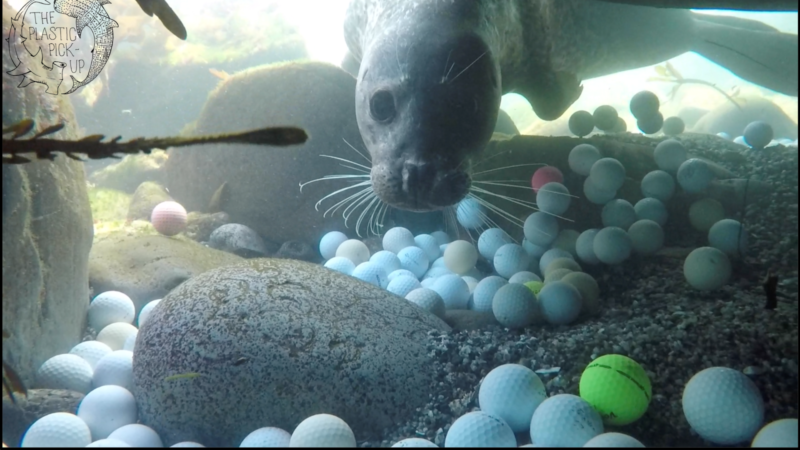 While chemicals from 50,000 or so golf balls will have only a small effect on the ocean, Savoca says they do degrade into microplastic pieces that marine animals could eat. The team also notes that there are lots of coastal golf courses around the world, so this may go beyond California.